An evaluation of research reported in this book shows the problematic nature of understanding some of the universal values associated with objectivity such as certainty, value neutral observations, facts, infallibility, and truth of scientific theories and laws. These results provide a detailed account (over a period of almost 25 years) of how the science education research community conceptualizes the difficulties involved in accepting objectivity as an unquestioned epistemic virtue of the scientific enterprise. Analyses of general chemistry textbooks are used to introduce the idea of “transgression of objectivity” and that scientific progress (nanotechnology) is at a crossroads. 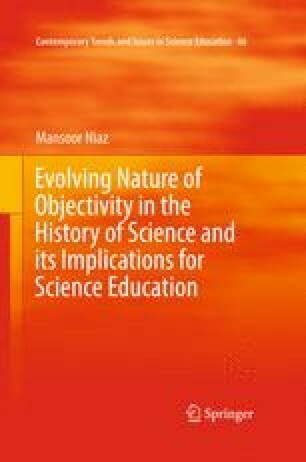 Given the importance of objectivity/subjectivity dichotomy in science education, it is plausible to suggest that objectivity has become an opiate of the academic. Although, achievement of objectivity in actual scientific practice is a myth, it still remains a powerful and useful idea. It seems that more work needs to be done in order to facilitate a transition toward a more nuanced understanding of objectivity and eventually the dynamics of scientific progress.